QuESt – short for Quality Enzyme Solutions – is our all-in-one solution to give your enzymes the competitive advantage. We can enhance every property of your enzyme, including enzymatic activity, thermal resilience, solvent stability, pH resistance, substrate specificity product spectrum, removing inhibitory effects and more. Our track record spans more than 30 enzymes and assays including lipases, proteases, polymerases, laccases, monooxygenases, reductases, sugar isomerases, cellulases, phytases, pectinases, glucose oxidases, amylases and alcohol dehydrogenases that are expressed and screened in our four expression platforms E. coli, B. subtilis, S. cerevisiae and P. pastoris. QuESt employs our protein engineering strategy “KnowVolution” – a knowledge-gaining directed enzyme evolution. KnowVolution is a combined approach of random and rational enzyme evolution, compensating the disadvantages of purely random or purely rational (computational) evolution strategies. As a result, we achieved both a high cost efficiency and increased success chances. Each of our projects is tailored to your enzyme, your application and your needs. We claim to be as flexible as research projects allow with optional project time-outs in which you can test our evolved variants as well as milestones to report and assess the progress. 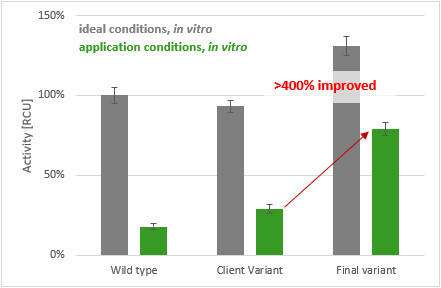 Find below two success stories of our QuESt service where we applied our advanced Directed Evolution strategy “KnowVolution” to engineer superior enzyme variants. Over the course of 11 months at 1 FTE, the specific activity of the evolved polymerase variants were improved by a factor of 40 compared to the wild type polymerase. 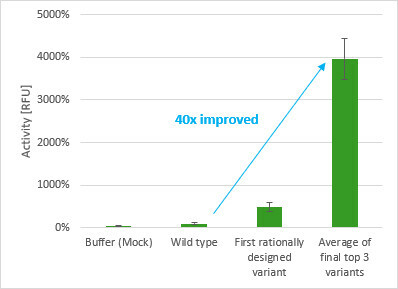 Over the course of 11 months at 1 FTE, the long-term stability of the final variant was enhanced by more than 400% compared to the best performing variant of the client. Send us on your QuESt! Interested in a tailor-made Directed Enzyme Evolution project that considers your deadlines, budget, internal decision processes, offers cost transparency, flexibility and ensures exclusive IP ownership of the evolved enzymes? We gladly design a comprehensive Directed Evolution project for your that fulfils your specific demands. Contact us to start your QuESt today. …interested in our Directed Evolution expertise but have internal computational analysis or algorithms that you would like to use? Or you have another development partner for the rational enzyme design? Our flexible Directed Evolution projects can be specifically designed to include your internal/external expertise and use the available resources in the most efficient manner. …looking for a wet-lab partner for Directed Enzyme Evolution or to jointly offer all-in-one evolution services? We would be happy to learn more about your expertise and team up with you to jointly evolve the enzymes of the future! We are a true fan of win-win-win scenarios! Get in touch with us to discuss partnership opportunities for joint Directed Evolution.